AMPLITUDES OF THE ROTATIONAL LIGHT CURVES OF COMETS"
diameters that may  be evidence of rotational evolution. available elsewhere in this web page. corrections and additions, or by sending new data. 051126 Schleicher et al. 1998. 051205 Snodgrass et al. 2005. 060304 Toth and Lisse, 2006. 060812 Weissman et al., 1999. 061103 Manzini et al., 2006. Table 1. (Continued) ROTATIONAL PERIODS AND PEAK TO VALLEY AMPLITUDES. *1P/Halley and 2P/Encke exhibit complex rotation (two periods). ptv-Amplitudes = 0.52±0.26 (58 observations). UR= Unpublished Result, Ferrín (2006). A'Hearn, M., Campins, H., Schleicher, D. G., Millis, R. L., 1989. Ap. J., Vol. 347, p. 1155. For the Target Nucleus-Comet 9P/Tempel 1. Icarus, in Press. of Comets, Contrib. Perkins Obs. No. 19. Astron. Astrophys., V. 341, p.912-917. Schwehm, G., 2002. VLT Observations of Comet 46P/Wirtanen. Astron. and Astrophys., 387, 1107-1113. Comet Neujmin 1, Ap. J., Vol. 316, p. 847. A warm and small nucleus", An. J., Vol. 108, p. 2318-2322. And Colors of Unusual Minor Planet 1996 PW", Icarus, Vol. Delahodde, C.E., Meech, K.J., Hainaut, O.R., Dotto, E., 2001. Detailed Phase Function of Comet 28P/Neujmin 1. Astron. And Astrophys., 376, p. 621-640. Feldman, P.D., Budzien, S.A., Festou, M.C., A'Hearn, M.F., Tozzi, G.P. of Comet Levy 1990c. Icarus, 95, p. 65-72. A'Hearn, M., Lamy, P., Livengood, T., Kostiuk, T., 2000. Icarus, Vol. 147, p. 145-160. Baharew-Macfarlane-Krienke (1955f), 2002. Meteors, No. 19. 67P/Chruyumov-Gersimenko, 81P/Wild 2", 2005. Icarus, in press. Astron. Astrophy., 1994. Vol. 289, p. 304-310. Gehrz, R., Jones, T., 1995. An. J., Vol. 110, p. 1866-1874. Comets 126P/IRAS and 103P/Hartley 2. A&A, 419, p. 375-383. P/Arend-Rigaux. Icarus, Vol. 64, p. 329-335. Preliminary Comparison With Asteroids, 1988. Ap. J., Vol. Jewitt, D., Luu, J. X., 1989. A CCD Portrait of Comet P/Tempel 2. An. J., Vol. 97, p. 1766-1790. Jorda, L., Lecacheux, J., Colas, F., Frappa, E., Laques, P., 1998. Comet 55P/Tempel Tuttle, CIAU 6816. E., Lara, L.M., 1999. The Rotational Parameters of Hale-Bopp (C/1995 O1) From Observations of the Dust Jets at Pic Du Midi Observatory. EMP, 77, p. 167-180. Lamy, P., Toth, I., 1995. Direct detection of a cometary nucleus with the Hubble Space Telescope", Astron. and Astrophy., Vol. 293, p. L43-L45. Lamy, P., Toth, I., Weaver, H., 1998. Hubble Space Telescope Observations of the Nucleus and Inner Coma of Comet 19P/1904 Y2 (Borrelly), Astron. Astrophys., V. 337, p. 495-954. Lamy, P., Toth, I., A'Hearn, M., Weaver, H., Weissman, P., 2001. Hubble Space Telescope Observations of the Nucleus of Comet 9P/Tempel 1. Icarus, 54, p. 337-344. Lamy, P., Toth, I., Weaver, H., Jorda, L., Kaasalainen, M., 2003a. The Nucleus of Comet 67P/Churyumov-Gerasimenko, the New Target of the rosetta Mission, DPS 35th Meeting, Sept. 2003, abstract 30.04. Lamy, P., Toth, I., Fernandez, Y.R., Weaver, H.A., 2003b. The Sizes, Shapes, Albedos, and Colors of Cometary Nuclei. In Comets II, Festou, M., Keller, H.U., Weaver, H.A., Editors, p. 223-264. University of Arizona Press, Tucson. Larson, S. M., Minton, R. B., 1973. Photographic Observations of Comet Bennett 1970II", Lunar and Planetary Lab., Report No. 26. Larson, S.M., Hergenrother, C.W., 1995. Comet 41P/Tuttle-Giacobini- Kresak. IAUC 6140. Lecacheux, J., Frappa, E., 2004. Comet C/2001 Q4 NEAT. IAUC8349. Lecacheux, J., Jorda, J., Colas, F., 1997. Comet Hale-Bopp C/1995 O1, IAU Circular No. 6560. Leibowitz, E. M., Brosch, N., 1986. Periodic Photometric Variations in the Near Nucleus Zone of P/Giacobini-Zinner", Icarus, V. 68, p. 430-441. Licandro, J., Tancredi, G., Lindgren, M., Rickman, H., Gil-Hutton, R., Tozzi, G.P., 2000. CCD Photometry of Cometary Nuclei, I: Observations from 1990-1995, Icarus, 147, p. 161-179. Lisse, C.M., Fernandez, Y.R., Kundu, A., A'Hearn, M.F., Dayal, A., Deutch, L.K., Fazio, G.G., Hora, J.L., Hoffman, W.F., 1999. "The Nucleus of Comet Hayakutake (C/1996 B2)", Icarus, V. 140, p. 189-204. Lowry, S.C., Weissman, P.R., 2003. 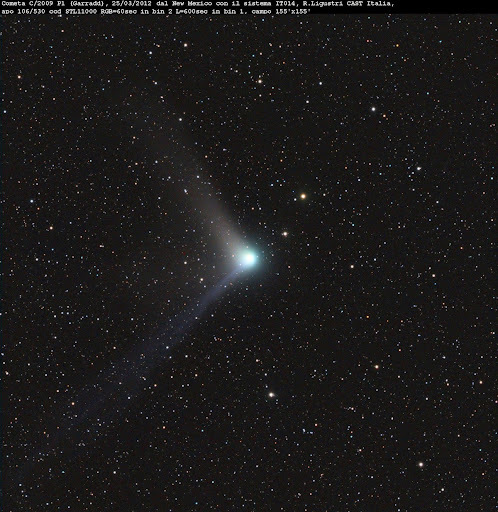 CCD Observations of Distant Comets From Palomar and Steward Observatories. Icarus, 164, p. 492-503. Lowry, S.C., Weissman, P.R., Sykes, M.V., Reach, W.T., 2003. Observations of Periodic Comet 2P/Encke: Physical Properties of the Nucleus and First Visual-Wavelength Detection of Its Dust Trail. Lunar and Planetary Science, XXXIV, 2056.pdf. Lowry, S.C., Weissman, P.R., 2007. Rotation and Color Properties of the Nucleus of Comet 2P/Encke. Icarus, in press. Luu, J. X., Jewitt, D. C., Icarus, 1990. The nucleus of comet P/Encke, Vol. 86, p. 69-81. Luu, J., Jewitt, D., 1992. Near Aphelion CCD Photometry of Comet P/Schwassmann-Wachmann 2, An. J., Vol. 104, p. 2243-2249. Luu, J., Jewitt, D., 1993. Periodic Comet SW 1. IAUC 5692. Magdziarz, P., Winiarski, M., Waniak, W., 1995. CN Photometry of Comet Levy 1990XX", Icarus, V. 116, p. 40-45. Manzini, F., Schwarz, G., Cosmovici, C.B., Guaita, C., Comolli, L., Brunati, A., Crippa, R., 2006. EMP, 100, 1-16. Meech, K.J., Jewitt, D., Ricker, G.R., 1986. Early Photometry of Comet P/Halley: Development of the Coma, Icarus, Vol. 66, p. 561-574. Meech, K., Belton, M.J.S., Mueller, B., Dickinson, M., Li, H.R., 1993. Nucleus Properties of P/Schwassmann-Wachmann 1. An. J., V. 106, p. 1222-1236. Meech, K., Bauer, J.M., Hainaut, O.R., 1997. Rotation of Comet 46P/Wirtanen. A&A, 326, p. 1268-1276. Meech, K., A'Hearn, M.F., McFadden, L., Belton, M.J., Delamere, A., Kissel, J., Klassen, K., Yeomans, D., Melosh, J., Schultz, P., Shunshine, J., Veverka, J., 2000. "Deep Impact - Exploring the Interior of a Comet. In a New Era in Bioastronomy, ASP Conference Series, Vol. 213, G. Lemarchard, K. Meech, Editors, p. 235- 242. Millis, R. L., A'Hearn, M., Campins, H., 1988. An Investigation of the Nucleus and Coma of Comet P/Arend-Rigaux", Ap. J., Vol. 324, p. 1194-1199. Millis, R.L., Schleicher, D.G., 1986. Rotational Period of Comet Halley, Nature, Vol. 324, p. 646-649, 1986. Mueller, B. E. A., 1991. CCD Photometry of comets at large Heliocentric distances, in Asteroids, Comets, Meteors 1991, p. 425-428, Lunar and Planetary Institute, Houston. Mueller, B.E.A., Ferrin, I., 1986. Change in the Rotational Period Of Comet P/Tempel 2 Between the 1988 and 1994 Apparitions. Icarus, 123, p. 463-477. Mueller, B.E.A., Samarashinha, N.H., 2002. "Visible Lightcuve Observations of Comet 19P/Borrelly". EMP, 90, p. 463-471. Mueller, B.E.A., Heinrich, A.M., 2002. Physical Properties of the Nucleus of Comet 28P/Neujmin 1. DPS 34th Meeting, Sesion 27, Abstract 27.04. Navarro, J.P., Riquelme, M., 2003. Calculo del Periodo de Rotacion y Diametro del Nucleo del Cometa 2002 V1 NEAT. Meteors, 5, p. 21-29. Ortiz, J.L., Rodriguez, E., 1999. The Rotation of Comet C/1995 O1 Hale-Bopp From Inner Coma Photometry. EMP, 77, p. 1997-1990. Osip, D., Campins, H., Schleicher, D., 1995. The Rotation State of 4015 Wilson-Harrington: Revisiting Origins for Near Earth Asteroids, Icarus, Vol. 114, p. 423-426. Pansechi, L., Fulle, M., 1991. On The Rotation of the Nucleus of the Great Comet of 1744, Icarus, V. 89, p. 65-72. Sagdeev, R.Z., Szego, K., Smith, B.A., Larson, S., Merenyi, E., Kondor, A., Toth, I., 1989. The Rotation of P/Halley, An. J., Vol. 97, p. 546-551. Schleicher, D.G., Farnham, T.L., Smith, B.R., Blount, E.A., Nielsen, E., Lederer, S.M., 1998. Nucleus Properties of Comet Hale-Bopp (1995 O1) Based on Narrowband Imaging. Sekanina, Z., Distribution and Activity of Discrete Emission Areas on the Nucleus of Periodic Comet Swift-Tuttle. 1981. An. J., Vol. 86, p. 1741-1773. Sekanina, Z., "Nucleus of Comet Iras-Araki-Alcock 1983 VII". 1988. An. J., V. 95, p. 1876-1894. Sekanina, Z., 1989. Nuclei of Two Earth-Grazing Comets of Fan-Shaped Appearance. An. J., V. 98, p. 2322-2333. Sekanina,Z., Farrell, J.A., 1978. Comet West 1976 VI: Discrete Bursts of Dust, Split Nucleus, Flare Ups, and Particle Evaporation, An. J., 83, p. 1675-1680. Sekanina, Z., Farrell, J.A., 1982. Two Dust Populations of Particle Fragments In the Striated Tail of Comet Mrkos 1957 V". An. J., V. 87, p. 1836-1853. Sekanina, Z., 1991. Comprehensive Model for The Nucleus of Periodic Comet Tempel 2 and its Activity. An. J., 102, p. 350-388. Scotti, J., 1993. Comet P/Reinmuth 2, IAU Circular 5772. Schleicher, D.G., Millis, R.L., Osip, D.J., Birch, P.V., 1991. Comet Levy (1990c): Groundbased Photometric Results, Icarus, 94, p. 511-523. Snodgrass, C., Fitzsimmons, A., Lowry, S.C., 2005. The Nuclei of Comets 7P/Pons-Winncecke, 14P/Wolf and 92P/Sanguin. Astronomy and Astrophys. 444, 287-295. Snodgrass, C., Fitzsimmons, A., Lowry, S., 2005b. Physical Properties of Seven Cometary Nuclei. In: Asteroids, Comets, Meteors 2005. IAU Symposium No. 229, ACM 2005 Conference, 7-12 August 2005, Buzios, Rio de Janeiro, Brazil. Abstracts. Cited by Toth, I., Lisse, C.M., 2006. On the rotational breakup of cometary nuclei and centaurs. Icarus 181, 162-171. Snodgrass, C., Lowry, S.C., Fitzsimmons, A., 2006. Photometry of cometary nuclei: Rotational rates, Colour and a comparison with Kuiper Belt objects. MNRAS, in press. Stansberry, J.A., and 17 colleagues, 2004. Spitzer Observations Of the Dust Coma and Nucleus of 29P/SW 1. Ap. J., 154, p. 463-473. Toth, I., Lisse, C.M., 2006. On the rotational breakup of cometary nuclei and centaurs. Icarus 181, 162-177. Vedeer, G.J., Hanner, M.S., Tholen, D.J., 1987. The Nucleus of Comet P/Arend Rigaux, An. J., V. 94, p. 169-173. Vorontsov-Velyaminov, B., 1930. Imaginary Contradiction of the Phenomena Observed in the Comet Brooks 1893 IV with the Mechanical Theory of Comets, Russian Astron. J., V. 7, p. 90-99. Wasserman, L.H., Millis, R.L., Schleicher, D.G., 1995. Comet 6P/D'Arrest. IAUC 6140. Watanabe, J., Nakamura, T., 1990. Detection of Rotational Motion of Comet P/Brorsen-Metcalf 1989o". Publ. Astron. Soc. Japan, V. 42, p. L7-L10. Weissman, P., Doressoundiram, A., Hicks, M., Chamberlin, A., Sykes, M., Larson, S., Hergenrother, C., 1999. AAA, DPS Meeting #31, abstract 30.03. Wisniewski, W.Z., Fay,T., Gehrels, T., 1986. Light Variations of Comets. p. 337-339, in Asteroids, Comets, Meteors II, Lagerkvist C., Lindblad, B.A., Lundstedt, H., Rickman, H., Editors, Uppsala University, Uppsala. Whipple, F., Rotation and Outburst of Comet P/SW 1. 1980. An. J., 85, p. 305-312. Yoshida, S., Aoki, T., Soyano, T., Tarusawa, K., Van Driel, W., Hamabe, M., Ichikawa, T., Watanabe, J., Wakamatsu, K., 1993. Spiral Dust-Jet Structures of Comet P/Swift-Tuttle 1992t. PASJ, Vol. 45, p. L33-L37.